Trials of a "silicon womb" that holds test-tube embryos inside the womb to expose them to more natural conditions will shortly begin in the UK. Researchers say the new device may produce better quality embryos and reduce the need to harvest so many eggs from infertile women. In standard IVF, eggs harvested from a woman are fertilised in the lab and allowed to develop in an incubator for 2 to 5 days. The healthiest embryos are chosen to be transferred into the uterus. 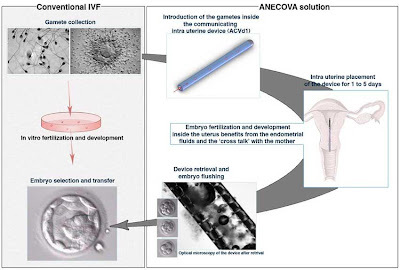 The new device allows embryos created in the lab to be incubated inside a perforated silicon container inserted into a woman's own womb. After a few days, the capsule is recovered and some embryos are selected for implantation in the womb.